This 2,000 mile all-paved Pacific Coast Highway motorcycle tour is a dream motorcycle trip along the West Coast of the United States. Start in Long Beach, California and ride through famed Sequoia National Park and Yosemite National Park before crossing the Golden Gate Bridge in San Francisco. From there, follow Highway 1 all the way to Portland Oregon. Explore the Shasta-Trinity National Forest and the famed Avenue of the Giants featuring old-growth redwoods. 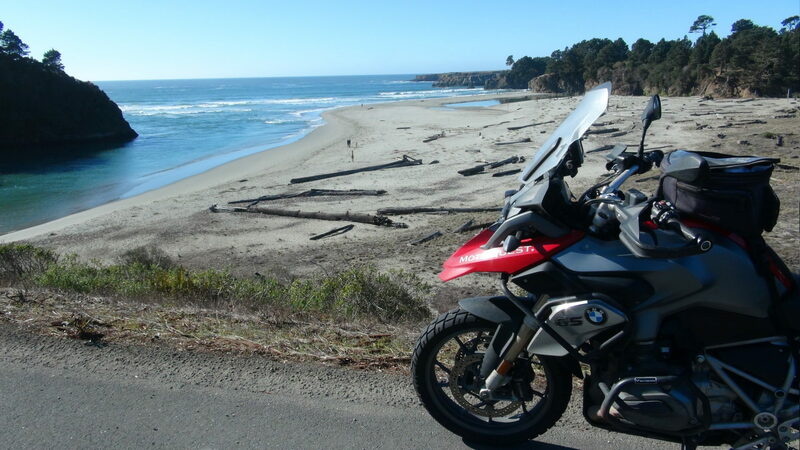 Curves, Redwoods, and ocean-view riding… now this is a motorcycle holiday! Road Conditions: This is a paved itinerary and features pectacular coastline riding mixed with delightful (and world-class) curves through old growth Redwoods and Sequoias. DAY 1 - Your motorcycle adventure starts by arriving in Long Beach, California today. Hotel check in and Welcome Dinner this evening, where you can meet the members of the group. Stay in Long Beach, California. DAY 2 - Long Beach, CA to Kernville, CA: Ride the world famous Angeles Crest Highway through the Angeles National Forest. Enjoy some great California back roads on your way to Kernville, California. Stay in Kernville, California. DAY 3 - Kernville, CA to Dunlap, CA: Be awed by "The Mighty 190" and its hundreds of curves. Spend another day riding twisties tthrough the mountains. Explore Sequoia National Park with trees up to 2,500 years old. Stay in Dunlap, California. DAY 4 - Dunlap, CA to Yosemite National Park, CA: Start your day near the doorstep of Kings Canyon National Park and Sequoia National Park. Ride through the endless curves near Kings Canyon National Park to Yosemite National Park and explore the amazing Yosemite. Stay near Dunlap, California. DAY 5 - Yosemite National Park area to Stinson Beach, CA: Have fun riding the back roads from Yosemite National Park to San Jose, California. End your motorcycle ride by crossing the iconic Golden Gate Bridge near San Francisco to Highway 1 and the Pacific coast. Stay in Stinson Beach, California. DAY 6 - Stinson Beach, CA to Shelter Cove, CA: Wake up to ride from the scenic beach town of Stinson Beach. Enjoy Highway 1 and its shoreline views all the way to The Avenue of the Giants with its 500 year old growth Redwoods. Ride through the Chandlier Tree in Leggett, California. Stay in Shelter Cove. DAY 7 - Shelter Cove, CA to Trinidad, CA: Today is a day for the Redwoods! You may take a long day ride through the Shasta-Trinity National Forest, or stroll through the Avenue of the Giants full of old growth Redwood Trees. Stay in Trinidad, CA. DAY 8 - Trinidad, CA to Florence, OR: View the historic Umpqua Lighthouse and ride through Redwood National Park on your way north. Moto-travel through the old growth forests of Oregon and the Oregon Sand Dunes. Stay in Florence, Oregon. DAY 9 - Florence, OR to Astoria, OR: Start your ride today on Pacific Coast on Highway 1, passing through Newport, Cannon Beach, and Seaside, Oregon. End your motorcycle ride by stopping off and to see historic Fort Clatsop, from the Lewis and Clark Expedition. Stay in Astoria, OR. DAY 10 - Astoria, OR to Portland, Oregon: Ride from the mouth of the Columbia River by back roads to Portland, Oregon. Farewell Dinner this eveing. Stay in Portland, Oregon. DAY 11 - Fly Home or keep the dream alive. The next motorcycle adventure vacation awaits! MotoQuest guides wear Scorpion helmets, jackets, pants and gloves, and we outfit our motorcycles with luggage and accessories from Twisted Throttle. You can view and download our complete MotoQuest packing list here.